Spring is in the air! Or your wrist.. hair.. wherever! Spring is almost here. Can you feel it? One of the best ways to lighten my mood and get me ready for spring is with an uplifting scent. Here are a couple of my tried and true favorite Spring scents that I look forward to each season. Yves Saint Laurent Paris Roses des Bois - This is a flanker of YSL's iconic Paris created by Sophia Grojsman. For those who aren't up on 'fume terms, "flanker" means a tweak of a fragrance already in existence. Examples of good flankers: Thierry Mugler A*Men Pure Coffee, Mitsouko Fleur de Lotus and Chanel No. 5 Eau Premiere. Examples of flankers that flunked: Vera Wang Preppy Princess, DKNY Be Delicious in any variety (in most of these cases, the original has no place on this earth to begin with). This is discontinued but is available at some online fragrance discounters. Guerlain Quand Vient La Pluie - When The First Raindrops Begin To Fall, if the translation doesn't just give you the quinessential image of spring, I'm not sure what will. Top notes:bergamot, orange blossom and rosemary; Middle notes: heliotrope, jasmine and violet; Base notes: patchouli, praline and musks. This was made in limited quantities, but try the Guerlain counters at Bergdorf Goodman, Saks Fifth Avenue in New York and Guerlain's Las Vegas store. Guerlain Muguet - One of the highlights from my perfume collection. This tiny bottle was only available for one day in the month of May and usually only at the Guerlain flagship in Paris. Bergdorf Goodman occassionally gets bottles in, but in recent years, the renditions of Muguet have been mixed with other notes and just not as beautiful. This bottle is from 2006(?) and is in a Baccarat crystal bottle. I can't even talk about how much this cost for 20ml EDT. This is no longer available. You can buy decants at The Perfumed Court or check with Alena at at Bergdorf Goodman (212) 872-2734 to see when this year's edition will be in. Le Labo Tubereuse 40 - One of Le Labo's annoying City Exclusives. I want to protest these exclusives because I'm against the idea of them being exclusive to one city and not being available for mail order. What gets even me more is that they are DOUBLE the price!! Ranting aside, I do find this tuberose uplifting and happy. Available at Barneys New York on Madison Ave. and at Le Labo in New York. Frederic Malle Une Fleur de Cassie (in Beurre Exquis/body butter) - This literally smells like a flower blossoming on your skin. The body butter is appropriately named; it's exquisite! The concentration of scent in this product does not make you feel like you are missing out. I actually prefer this scent in this form. It makes it much more wearable and takes some of the edge off the scent. Available at Barneys.com and Frederic Malle. I have quite a few scents that I love and will be bringing you more perfume posts! What are some of your favorite fragrances for spring? Any new scents that you are dying to try? Michelle Williams At 83rd Annual Academy Awards - Makeup Tutorial Inspired by Michelle's Silvery Blue Undereye Liner Oscar Look! Michelle's Oscar Night Look and My Inspired Version. Close-up of Michelle's eyes. More subtle use of silvery grey eyeliner. My inspired look, a little more dramatic. We all can't have Chanel haute couture, so we gotta bling another way. Here's another gorgeous look from Oscar night. I love it when stars are brave enough to use color in their makeup for the red carpet. 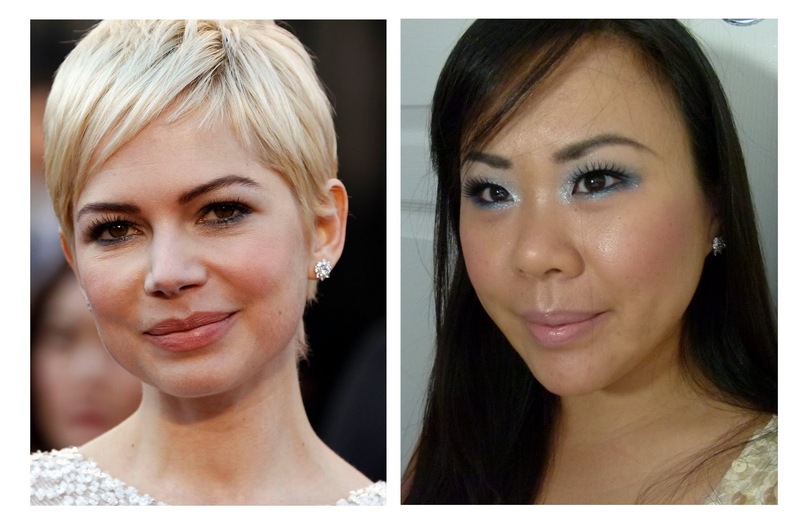 Even though subtle, Michelle Williams wore a shimmering silver blue eyeliner on her bottom lashline. I recreated a similar, but more dramatic look, here. On my face, I am wearing Guerlain Parare Gold Radiance Foundation in 03 dusted with MAC Prep + Prime Transparent Finishing Powder. On cheeks, Chanel Joues Contraste in Rose Dust. Lips MAC Kissable Lip Color in Enchantee mixed with Mehr lipstick. 1. Prime eye with Nars Smudge Proof Eye Primer. 2. Inglot Duraline + Sugarpill Lumi ChromaLust Loose Eyeshadow creates a luminous white, blue/green iridescent base to hold onto color all night. 3. Add lid color. I'm using MAC Eyeshadows in Waft and Gentle Fume. 4. Highlight inner corners of the eyes with shimmering white. I'm using Rondelle eyeshadow by MAC. 5. Line the lower lashline thickly with a grey blue pencil. I'm using Chanel Precision Eye Define in Denim. 6. Line the outer 1/3 of the upper and lower waterline in a grey pencil. I'm using Laura Mercier pencil eyeliner in Stormy Grey. 8. Curl lashes and add mascara. I'm using Giorgio Armani Eyes to Kill. 9. Add false lashes and fill in eyebrows. I used Bobbi Brown Gel Long Wear Eye Liner in Espresso Ink on my eyebrows. A pretty look for your Blue Valentine. Are there any Oscar winners or nominees that you haven't seen yet? I have quite a few on my Netflix queue!